2nd half goals from Santi Cazorla and Aaron Ramsey was not enough for Arsenal to salvage a point in Brittania after going down by 3 unreplied goals in the first half. Sanchez’s late goal against Southampton on Wednesday was a relief but Stoke took no prisoners on Saturday. Match report – Wenger’s Comment – Players Rating. 1. Expectations and counter – expectations. Brittania has always proven to be a difficult place for the gunners to get all three points. The last time Arsenal got three points there was when Ramsey was shawcrossed. Was the trend to continue? Well, it did. Even if Arsenal were not win, i expected at least a point and not going down by 3 goals by half time. Records and trends have psychological effect. The momentum generated before the game depleted within the 1st minute of game. Chelsea quest to match Arsenal’s invincible record was Cissed away at St James Park. Alan Pardew got a better of bitter Mourinho who could only complain about the fans at the park. Fabregas even described it as a joke to equal Arsenal’s record. But the current joke is that Arsenal could not cut short the 13pts difference. The joy of seeing Chelsea lose equals the pain of failing to take advantage. Santi Cazorla capped his relative good form by grabbing a goal albeit from the spot. The magician wasted no time in grabbing the ball after Flamini was fouled in the box, as if he owned the ball. Sanchez hovered like a hawk around Santi but Cazorla was looking at a metaphysical bush. Ramsey scored the goal he has been trying to. Sanchez’s corner flew to him and kpatakupum, he volleyed beyond Begovic. Hope he will improve in his primary duties. Inexperience will continue to haunt Chambers and Arsenal. Two silly yellow cards and the 19 year old defender became red on my FPL team. His suspension adds to Wenger’s ever increasing headache. Bellerin’s woeful play and substitution made Wenger to tinker his team with Flamini shifted to the right side of the defence. Flamini did well in the few minutes he anchored the right back position. His crossing may have been awful but he looked like a natural right back. He was tripped in the box to start Arsenal’s failed comeback. 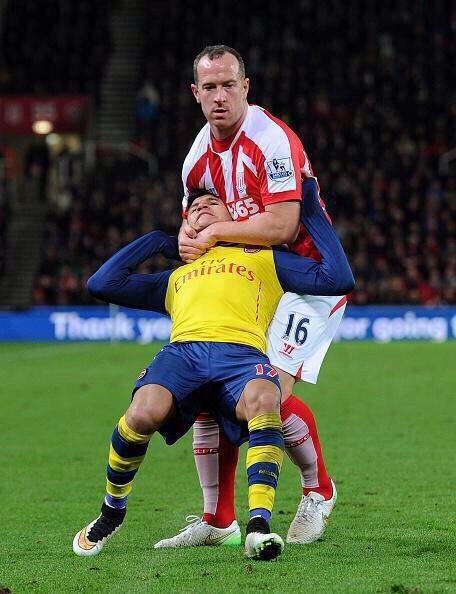 Other notable mentions include Per’s invisibility, Sanchez upright shot, Charlie Adams strangling Alexis etc.